There are many commercial centers in downtown Urumqi, such as Shizi streets, the North Gate, the South Gate, Erdaoqiao, Wuyi Road, Hongshan Market and Youhao (Friendly) Market. Commercial activities are also busy in the areas inhabited by the Uygurs, who are talented businessmen and gifted artisans of arts and crafts. 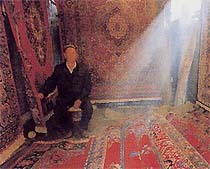 The famous local products are the small Uygur caps, silk and satin from Aidelis, knives from Yengisar, carpets from Hotan, and raisin, dried apricot slices, walnut, and fresh fruits.